This story is on my Hindi learning, the initial stages I went through. My father was a Hindi professor, so it was not a major surprise to anyone that all of us were proficient in Hindi. We spoke Hindi at home, we wrote letters to various relatives in Hindi (right from Pujyawar Baba to Saadar Charan Sparsh), we took part in Hindi elocution contests and generally were considered the Hindi gurus in our respective classes. Hindi education for all of us began with a particular text book. 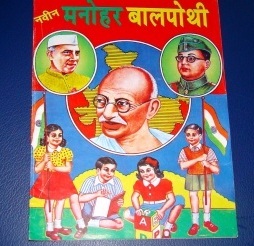 No sooner we were some 3 years old, Pitaji woulod buy a text book called Manohar Pothi. A slim booklet printed in black and white. I discovered much later that it was written by a very respected litterateur Shivpujan Sahay. There was something unique about this book: it did not teach Hindi the conventional way starting from the basic alphabet, but jumped straight into words and even sentences. Like “Ma” “Mala” “la”, eventually brought together in a neat little sentence, “Ma mala la”. Of course there were the usual line drawings of a lady (=ma) and a mala. That was, I suppose, more to drive home the point rather than illustrate the book for a child’s amusement. I have always thought that this made me one-up on other kids who studied Hindi the conventional way, “Ka se kabutar”, “Kha se khargosh” (sometimes “kha se kharaha” as well), “ga se gadha”… etc. Some of the more interesting ones I remember are “Tha se Thathera” preceding “da se damru” and “Sha se Shatkon”. Thathera, means a domestic utensil repairman, was illustrated by an oldish, dhoti-clad gentleman bending over a bunch of utensils probably straightening out the contours of a lota or a thali. Shatkon means a hexagon, mind you this word was spelt with the alphabet for Sha which resembles a “pa”, and not the sha with which you spell “shaaam”. And if you are interested in more of the “complicated words, Ksha was for kshatriya, tra was for trikon! Not the real Manohar Pothi, but a wannabe! The world of talavya, dantya and moordhanya “sa’s” was very complicated (even my name has two of these!!) and we were better off with “Manohar Pothi”! 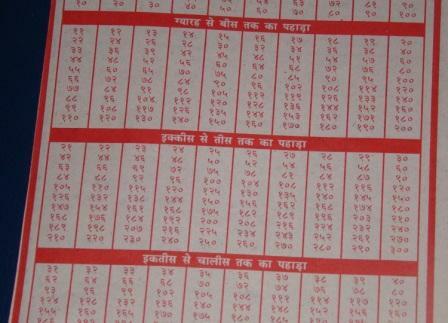 And the Hindi learning was not limited to the alphabet; it went on to numerical skills as well. First, the counting. Ek, do,teen. That was easy. But in the best traditions of Bihari scholars it was important for me to be proficient in multiplication tables as well. Tables of 2, 3 etc were “mastered” initially and then followed the tables of the double digit numbers. These were taught with creativity to get the attention of kids. Very poetic, if a multiplication table can be. Sample this. Table for 15. Dooni tees (15X2=30), tee paintalees, chaukey saath (15X4=60).., which went on to atthey beesa (15X8= 120), nau painteesa (15X9=135). There were some nerds in our community who always wanted to show off their skills with tables for fractions… sawaiya (tables for 1 ¼), adhaiya (tables for 2 ½). But I managed to stubbornly avoid these! 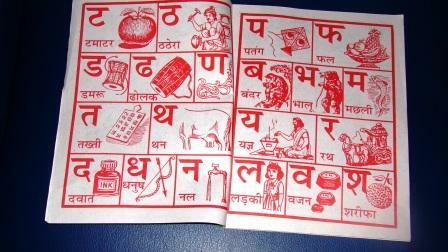 Over time I learnt how to read and write Hindi and it was time to graduate to kids’ magazines. Those days there were four key publications, Parag, Nandan, Chandamama and Bal Bharati. We subscribed to the first two, the other two were read infrequently. Between Parag and Nandan, Parag had more contemporary contents while Nandan dealt with kings and queens. Parag by far was my favorite and I still remember two great story-tellers who were regulars at Parag, Avatar Singh whose stories of Dadaji and Nanaji and their respective groups of grand-children and their friends were always very hilarious. And then there was Vidwan K. Narayanan, a Chennai-based writer who used to write most poignant stories. Nandan had Raja-rani stories but somehow they were much better as compared with Chandamama’s fare. By a strange quirk, the editor of Parag was the renowned Hindi writer Kanhaiyalal “Nandan”! What fights we kids would have in the house when the latest copies of Parag and Nandan would arrive! Anyway, as the years transpired I moved on to more serious stuff; Premchand, Devaki Nandan Khatri, Gulshan Nanda. And then some more. But I suppose I shall write about this phase in a later post. This entry was posted on Monday, October 13th, 2008 at 6:35 pm and is filed under Uncategorized. You can follow any responses to this entry through the RSS 2.0 feed. You can leave a response, or trackback from your own site. Good read….Did you forget “Bal Pocket Books”? We read them lots. My grandfather had subscribed to them and they would come in bundles of five all the way from Lucknow….then I remember there were some detective books in which 2 teenages boys were detectives and they solved mysteries and it was a series like the Hardy Boys,Nancy Drews….but in Hindi of course. It is sad that these days kids are just reading in English and HIndi books are avoided! It was Ram Rahim series of books published by Manoj Bal pocket books. The stories were superb.Later on, there were Ram Rahim series of comics books, but the comics books stories were no patch on the outstanding stories in Ram Rahim bal pocket books that were published in early 1970s. Seema: Thanks for reminding me of the “Pocket Books”. They really were “pocket” sized, right? And, if I remember correctly, their USP was an investment of 10 paise only per day for a period of 3 months to get the bunch. At least during my time. I do not quite recollect the Hardy Boys’ equivalent, though. Yes, I too regret that our kids are not into Hindi reading at all. Quite unique and refreshing…I was a voracious reader of pocket books.at times even used to read them in classrooms..Thanx for taking me down the memory lane..
Amit: That is a surprise; you too loved those pocket books? Wonderful! I wish to buy old issues of the hindi magazine parag…1960-1974 issues. If you find a source, please do let me know. I would love to have a set as well! Guys, Does anyone remembers Rajan Iqbal, the duo young detectives created by SC Bedi ( guess subhash chand bedi) of Diamond pockets? It used to be a fabolous bal pocket books during late 70’s .I still have the faint memory of ” maut ka mahal” and ” manhoos heere” the sequel .